It is a huge privilege and delight for us to give you the chance to join to us as our guests for the historic unveiling of our magnificent new cruise ship, Spirit of Discovery. 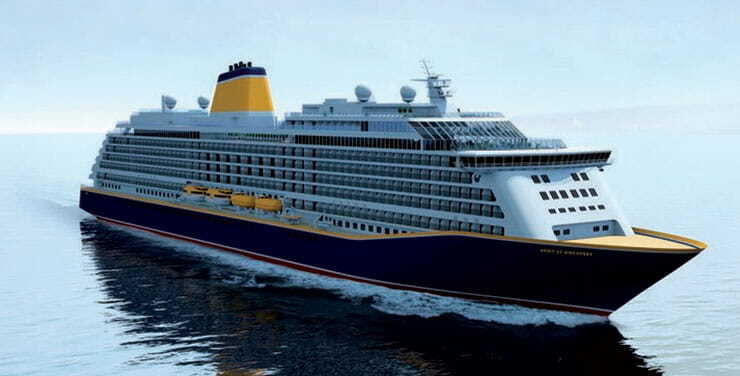 Marking a significant moment in Saga's history, one lucky Possibilities member and your guest will have the opportunity to experience the naming ceremony of Spirit of Discovery in Dover this July. With cuisine styles from all over the world, the new luxury ship boasts our widest-ever selection of restaurants on a par with London’s finest, from the glamour of the Grand Dining Room to oriental and seafood eateries. Spirit of Discovery also offers plenty of space for relaxation, including two pools, a theatre and a sumptuous spa, plus the delights of a secret terrace. The spacious cabins have a real wow factor, too. Each has a balcony, giving guests your own private space, inside and out. On arrival guests will be shown to their cabin prior to the ceremony on the quayside. Entertainment, food and drink will be available on the Quay at a Grand Afternoon Tea party before guests are asked to take a seat for the formal ceremony and blessing led by the Saga leadership team. Spirit of Discovery's Godmother (to be announced) will formally name the ship by the traditional smashing a bottle of bubbly against the bow, before guests are invited back on board to continue the festivities over dinner, with further entertainment and an overnight stay in one of the new ship's luxury cabins. We have three pairs of tickets up grabs for the naming ceremony of our new cruise ship Spirit of Discovery, on 5-6 July 2019 at Dover Cruise Terminal. Embark from 11am on Friday 5 July 2019. Disembark from 7am on Saturday 6 July 2019,. Quayside entertainment, food and drinks reception. Attendance at the ship's official naming ceremony. Once the ballot has closed and the winners have been drawn, they will be notified by email or phone to confirm they can attend. Winners will be given all the necessary information about the event and how to confirm attendance. Tickets are non-exchangeable and non-refundable, and cannot be transferred to someone else. Ballot prizes include tickets only. No travel is provided unless stated. 2.The ballot is free to enter and no purchase is necessary. 3. All entries must be submitted via www.saga.co.uk/membership only one entry per Member is permitted. 8. The winner will receive 2 tickets to the naming ceremony of our new cruise ship Spirit of Discovery, on 5-6 July 2019 at Dover Cruise Terminal. The all-inclusive prize for one winner and guest will include, Quayside entertainment, food and drinks reception, attendance at the ship’s official naming ceremony, formal dinner on board, on-board evening entertainment and an overnight stay in a twin cabin accommodation. All meals and drinks onboard are included (selected wines with lunch and dinner, Saga house-branded spirits, cocktails containing house-branded spirits, draught beer and lager, non-alcoholic cocktails, all mixers and soft drinks). Both passengers must have a current EU passport (6 months remaining) and a permanent UK address. Non-transferable, cannot be sold or exchanged for cash and is subject to Saga’s standard booking conditions. 9. The winner will be notified by email or telephone (using details provided when activating their membership) before midnight Friday 26 April 2019. If a winner does not respond to the Promoter within 24 hours of being notified by the Promoter, then the winner's prize will be forfeited and the Promoter will be entitled to select another winner in accordance with the process described above. 10. The prize will be sent to the winner by post or email (using details provided when activating their membership.